Incidents of theft in Chicago have risen by 27% over the past four years. Citywide, the rate of shooting incidents has gone up by 16%. 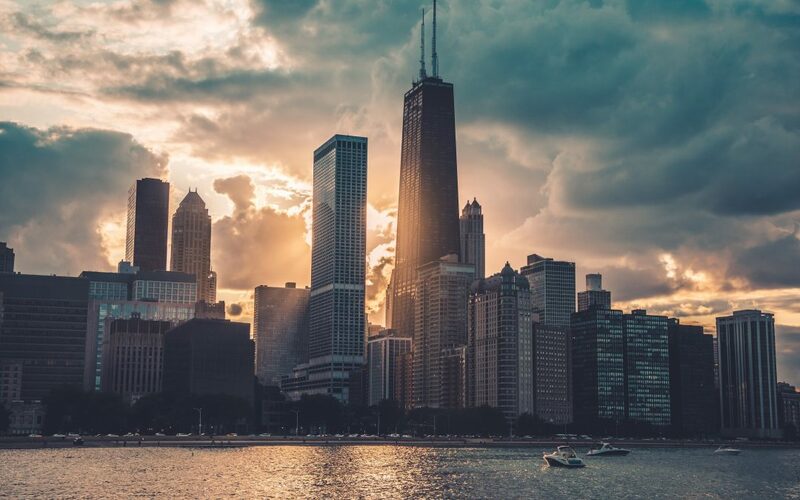 While the overall crime rate has dropped by 7% since 2018, like any large city, Chicago can still be a dangerous one. When you run a commercial business, it’s important to install business security cameras in Chicago. But not just any security camera will do. A city is a unique environment with a lot of foot traffic, difficult lighting, and weather that requires a durable camera. Do you have a motion-activated light at your home or business? Oftentimes, these lights will flicker on and off when a squirrel runs by, not just when you’re walking up your driveway. Motion-activated sensors are triggered by the smallest things. A bird, a squirrel, or wind-blown leaves floating by. A city is full of motion. Whether that’s pedestrians on the street or cars zooming by, you need to install business security cameras in Chicago that are accurate. The best place for a motion activated camera is in the low activity areas such as your employee parking lot. Motion sensor activation means that you can afford to guard your back or side doors (where most robberies happen) as well as your front door. Motion activated cameras save you money in energy efficiency by running only when needed. They can also save storage space and won’t fill up your hard drives with useless footage. Chicago is the home to the world’s first skyscraper. The 10-story Home Insurance Company was completed in 1884. At that point in time, it towered over the previously considered maximum height of 5-storeys. Now, Chicago is home to 124 buildings over 150 meters and 6 buildings over 300 meters. All of those tall buildings mean that there can be some dark spots throughout the city. Especially if your commercial business is shorter than some of the buildings around you, it’s a good idea to install business security cameras in Chicago that can handle low light. If you install a security camera with thermal imaging, then you’ll be able to capture high-quality images even in pitch darkness. Make sure you’re at least looking for cameras with low light accuracy. In a city, the amount of lighting you receive can change greatly according to the time of day. With low-light accuracy and thermal imaging, your camera can be effective no matter the time. For most business owners, their company is like their child. And like a child, it can be difficult to walk away from your building and trust that it will be safe overnight. Remote streaming capabilities allow you to check in on your security camera feeds via smartphone or desktop. Whenever you start to worry, you can log in and access the streams live. Think about the freeze during the polar vortex. If you couldn’t get to work, you wouldn’t have been able to make sure that no windows were broken, or that anything had stopped working due to the cold. Now, when you’re stuck at home, you can access the live video streams and see exactly how your building is doing in real time. However, if someone were able to remotely hack into your video streams, they could easily manipulate it for their own benefit. Password-protected video makes sure that remote streams are for your eyes only. When you install a great security camera, it’s really handy to be able to access your video feeds from anywhere- even when you’re not at the business. However, that perk can quickly become a downside if you receive an alert on your smartphone every time the motion sensor is activated or a customer walks in your front door. There are a lot of pedestrians on the streets of Chicago. For example, in one week in 2016, 1.61 million people traversed State Street between Wacker Drive and Congress Parkway. That’s a lot of people! Can you imagine if you received an alert every time someone walked by? Customizable alerts are key to being able to enjoy the remote streaming capabilities on any security camera. If you install business security cameras in Chicago that feature facial recognition capabilities, you can set it up so that you only receive alerts when a known criminal walks by or someone tries to open a side door that shouldn’t be accessible. No matter what your notification preferences are, it’s easy to set up alerts across a wide range of situations that will allow you to maintain security- no matter where you are. Thanks to the winter of 2018/2019, Chicago shattered its previous record low temperature with a mind-numbingly cold -44 degrees. The highest recorded temperature in Chicago went all the way up to 105 degrees in 1934. While extremes like these will only happen every once in a while, hopefully not in the same year, Chicago can be a tough environment for security cameras. While you want to install security cameras where they have the best visibility, often out in the open, you also need to look at the weather conditions they’ll be under. In our opinion, if you’re looking to install business security cameras in Chicago, you need to make sure they’re durable and rated for the outdoors. In other words, don’t install a home security system and expect it to hold up to the Chicago wind or winter. No matter what camera you choose, you still need high quality installation. Without the right installation team, you could find yourself dealing with bad cabling, low quality footage, and frequent connection issues. You rely on your security cameras to help protect your business. They can deter theft and prevent vandalism. But that’s only if they’re working. When you need to install business security cameras in Chicago, think Medlin. We’re Chicago natives- we’ve been working in Chicago since 1989. We work with several high-quality products, like Axis Video Surveillance, to provide you with the best in security systems. If you’re looking for the right installation company for your security cameras, get a quote today.